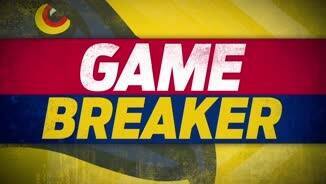 Adelaide Crows InterchangeMitch Grigg replaces Brodie Smith and is possibly out for the game. Crows InterchangeBrodie Smith and is possibly out for the game. 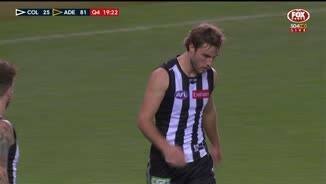 Collingwood InterchangeTravis Varcoe off due to an injury. 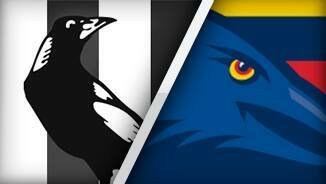 Magpies InterchangeTravis Varcoe off due to an injury. Adelaide's seemingly inaccurate tally of 12.15 is somewhat tarred by rushed behinds and from shots from outside 50 metres. 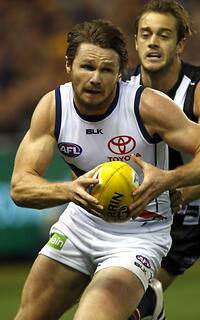 From shots within the 50 metre arc, the Crows have kicked 11.7. Crows InterchangeLuke Brown off due to an injury. Magpies InterchangeBen Sinclair off due to an injury. Welcome to Etihad Stadium for the Collingwood v Adelaide Crows Round 2 clash. 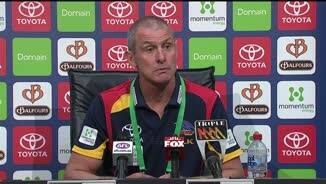 ADELAIDE is announcing itself as the real deal under new coach Phil Walsh, beating Collingwood by 27 points at Etihad Stadium on Saturday evening to make a perfect start to the season. 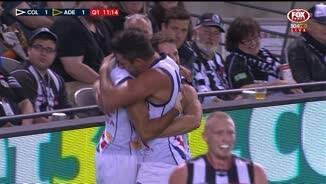 After Walsh told his club to take a cold shower and not get carried away by a big round one win over North Melbourne, the Crows turned up the heat and dominated the Magpies for three quarters to win 12.18 (90) to 9.9 (63). The win didn't come without a cost, however, with the Crows' best player on the day, Brodie Smith, taken from the ground on a stretcher with concussion early in the fourth quarter. Smith, who recovered sufficiently to join his teammates for the song in the rooms after the game, was slung in a tackle and his head crashed into Travis Varcoe's knee before hitting the turf. The All Australian half-back had been the best player on the ground, racking up 30 possessions, eight inside 50s and a goal, and using the ball with precision by foot. 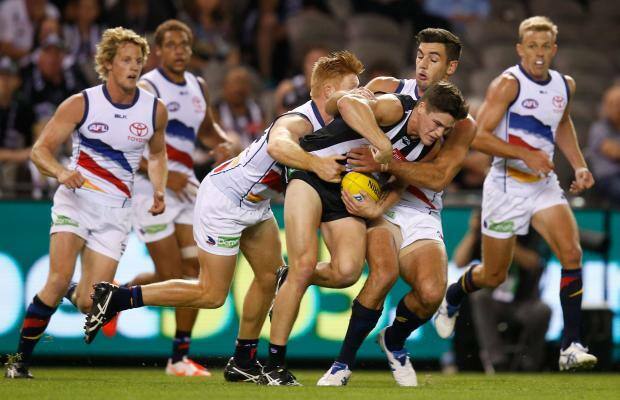 Led by the classy 23-year-old, the Crows built a 56-point lead at the final change and appeared to be cruising to a big win but inaccuracy in front of goal and a late rally from the Magpies prevented a blowout. 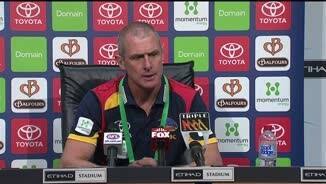 Walsh had this week spoken about the importance of winning in Melbourne for the Crows to gain respect as a team, and they achieved that mission on Saturday. "Unless you win here, I don't think you get rated," Walsh said post-match. "The competition is very Melbourne-centric and this is where nine of the 18 teams are, this is where the majority of the media are going to report on footy. "I don't think they would have thought it was a great performance but we were tough in the contest and I thought we competed really well." Ricky Henderson (22 possessions and nine inside 50s) gave the Crows their outside class, while Rory Sloane (23 and nine clearances) and Patrick Dangerfield (27 and eight, plus two goals) controlled the stoppages, with Adelaide winning the clearances 45-29. The Crows' tackling pressure around the ground and ability to have numbers at every contest meant they largely had the game on their terms, enjoying a 58-44 advantage in inside 50s. In contrast to Smith's elite kicking, the Magpies largely struggled to hit targets by foot for the first three quarters, but they did manage six of the game's last seven goals. Their tall forwards struggled because of the poor ball use, with Travis Cloke goalless against Daniel Talia, and Jesse White managing just one. 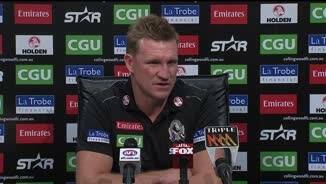 "(Adelaide's) intensity and pressure was excellent, especially early, and we didn't handle that particularly well," Collingwood coach Nathan Buckley said. "They definitely edged us for wont to go and win that footy and you only have to be off half a step and that's enough. I think that's what we saw. "That's potentially why you're not clean enough when you get your chances and we weren't clean enough. They for the most part were." The Magpies were able to withstand Adelaide's pressure for the first 12 minutes of the match, but it was only a matter of time before the Crows took control. Three goals in 13 minutes – including a gem from the boundary line by Eddie Betts – got the run started in the first quarter, and all with relatively limited output from star forward Taylor Walker, who finished with 2.3. Already on the back foot, the Magpies were forced to substitute Ben Sinclair late in the opening term after he suffered a hamstring injury right next to the interchange bench. A second-quarter push from the Magpies was quickly snuffed out, with four goals in seven minutes from the visitors blowing the margin out to 44 points. Captain Scott Pendlebury (29 possessions) and young half-back Adam Oxley (29 and nine rebound 50s) battled hard, and Jarryd Blair finished with three goals.